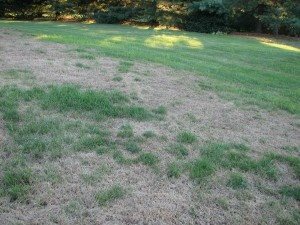 Take All disease first appears in late spring or early summer, as a patch of bronze or bleached turf. The center of the patch eventually dies and is can give rise to weeds, particularly annual bluegrass. Spots range from 4-6 in. (10-15 cm) in diameter at first, but may grow into large patches, several feet in diameter over a period of years. Plants affected have shallow root systems, and are easily pulled out of the ground. Black runner hyphae of the fungus can be observed on crowns and roots microscopically.